Soft microfiber composition perfect for interior work! SONAX Care Pad for Plastic is a circular, microfiber applicator used for the cleaning and dressing of interior plastics. Manufactured with a pouch that fits easily over 4 fingers, SONAX Care Pad for Plastic promotes an easy and effective grip during use, as well as increased mobility. Make sure every inch of your interior, even those hard to reach areas, are clean and protected with the SONAX Care Pad for Plastic! 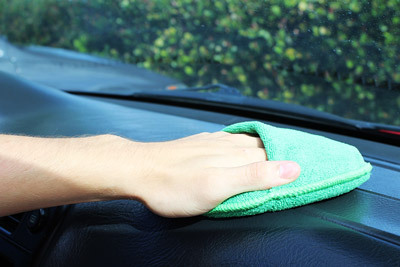 The SONAX Plastic Care Pad fits snugly over 4 fingers and gives you the ability to clean every inch of your interior! There are a lot of tricky locations in a car’s interior. Under the dashboard, the area between the gear shifter and the center console, between the back window and the rear seat – all are places that certainly need detailing but aren’t the easiest to reach. SONAX Care Pad for Plastic, thanks to its unique design, will fit perfectly into those areas! Using a 89/11 blend of polyester and polyamide, the SONAX Care Pad for Plastic will gently clean your interior surfaces without being too harsh. Use SONAX Care Pad for Plastic with SONAX Dashboard Cleaner to clean, and with SONAX Plastic Care to protect! A must have for applying interior products. Nice size. Don't overlook this item. Love mine.